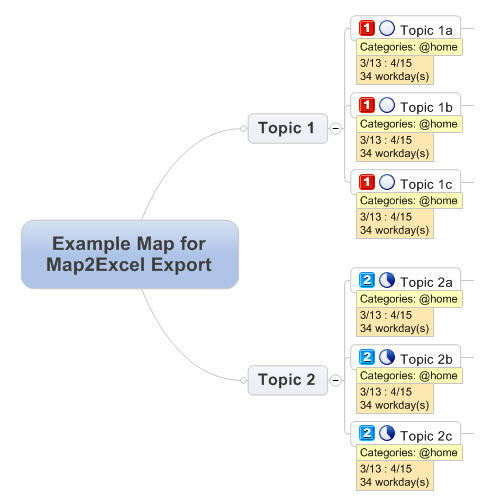 The Map2Excel tool has been converted to an easily installable MindManager add-in. More information is available here. The add-in also incorporates Map2Table and Map2Outline. To download the add-in, visit http://map2excel.com. Note that the ActivityOwner Tools Add-in is also fairly functional now and ready for testing and feedback. Hi Cesar — Its possible the issue is that you are using 18.2 and it was compiled for an earlier release. I just recompiled it with the latest mindjet version installed on my machine. Give it another try. Could you provide that information? After installation it shouldn’t need special rights to any location I don’t think. Just downloaded map2excel and am pleased with the export capability. Unfortunately, when I import an exported excel file I lose all the properties. Are there import options I don’t know about. The properties seem to be labelled “custom”. In any event, additional info would be appreciated. Hi Rich — Can you give some specific example of what you want it to do? The addin was developed quite awhile ago and mind manager may have evolved to have more/different attibutes than it was attributes originally designed for. Thanks for getting back to me. We are doing an analysis of a set of 12 complex development projects and are using MM to correlate observations and develop findings. We will most likely have 1500 or more observations to track, and we are guessing that we will need some statistical and other tool support for collection, analysis and presentation. Excel seemed an obvious tool to provide that support. We have been using tags, but thought properties might provide an easier means of recording and dealing with information like dates, and so forth. Therefore I was disappointed to find that properties came out labelled as custom in the spreadsheet, but were ignored when we read the sheet back in. We are using 2019 version, and I think we will be able to use tags exclusively, but really would like the option of properties. Oh – in addition, it was the ability to import using a spreadsheet to add information that was of particular interest of us as well, as we get observations in batches, and filling in the spreadsheet is easier than cutting and pasting and then manually creating and adding tabs. I’ve now officially purchased the product, and so am very interested in your response:-) One other issue we have found is that tags that are imported lose their hierarchical organization. Again, don’t know if this is because of the 2019 version or is just too difficult.